Laurence Sterne’s Tristram Shandy isn’t as modern as some critics believe. 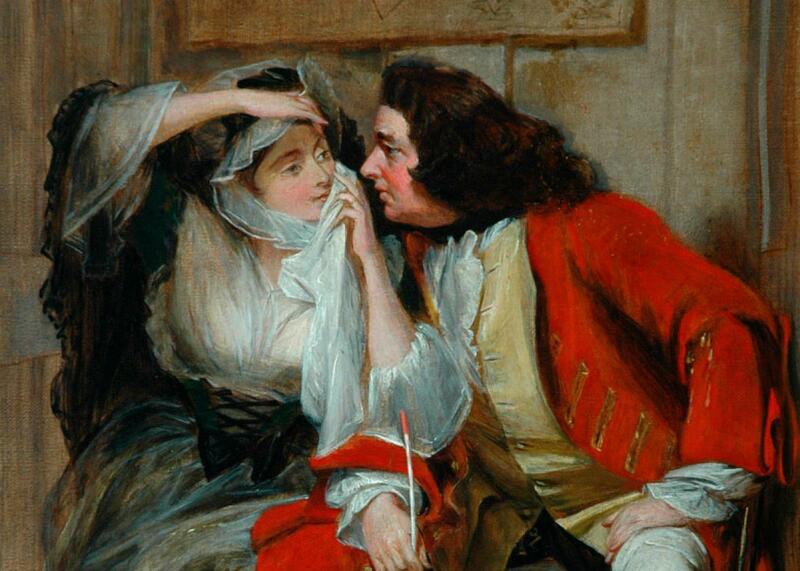 This 1810 painting shows two of the characters in Tristram Shandy, Uncle Toby and the Widow Wadman. It’s easy for a contemporary reader to agree. With its typographical tricks, maddening digressions, and insistence on exposing its own artifice, Tristram Shandy seems closer to the fourth-wall–shattering metafictions of Borges or Nabokov, or to the stream-of-consciousness wanderings of Proust or Woolf herself, than to the more conventionally realist fictions of Sterne’s closest contemporaries. But that raises a question: Just how did something so odd, so out of step with the norms of 18th-century fiction, appear in the first place? It’s easy to imagine Sterne as a lone weirdo tearing apart the rules of narrative art at the very moment his contemporaries were first perfecting them. But the truth is more complicated. Tristram Shandy wasn’t a unique avant-garde masterpiece awaiting the arrival of the 20th century to be appreciated. On the contrary, Sterne’s novel belonged to an already well-established tradition of “experimental” literature—a body of work every bit as formally adventurous as that of Sterne’s “modern” inheritors. For instance, Sterne himself continually pays homage—through subtle citations and sometimes outright plagiarisms—to a group of early modern writers: Erasmus, Montaigne, Rabelais, and Robert Burton. Though they sometimes deigned to tell stories, these writers more often produced extended-prose fugues on a particular subject (stupidity or melancholy, for example). Their works awkwardly straddle philosophy and satire. Packed with obscure knowledge and cut through with destabilizing ironies, they appear simultaneously obsessed with cataloguing all available human knowledge and ridiculing any attempt to know anything at all. Tristram Shandy’s mock-learning, bad puns, grotesque wit, and dizzying digressions had immediately recognizable origins in these earlier writers. The tradition represented by Erasmus, Rabelais, and Burton thrived in 18th-century England, and its satirical edge sharpened over time. Jonathan Swift’s A Tale of a Tub, another work Sterne loves to slyly quote, serves as one bridge between those earlier writers and Tristram Shandy’s metaphysical games. In it, Swift dons the guise of a scholarly know-it-all who rambles about scientific inventions and religious controversies. The narrator, however, turns out to be insane; his knowledge is not worth the paper it is printed on. The Tale mocks readers who would try to make sense of it—Swift attacks both scholars who hunt for secret messages and those who stick to the surface—and continually draws attention to its nature as printed matter: the text is pockmarked with typographical lacunae and oddities, typically just when the reader expects to receive some crucial piece of information. So what about Tristram Shandy’s relationship to the more conventionally “realist” novels of the time? Did Fielding and Richardson (and Behn, Defoe, and Haywood) merely serve as targets for Sterne’s satire? Is Sterne simply making fun of the early novel by exposing the artistic devices a more conventional novelist would prefer to keep hidden? Here, too, things are more complicated than they might appear. Samuel Richardson and Henry Fielding—to borrow only Woolf’s examples—are hardly the simplistic, flat-footed realists we might imagine. Fielding’s masterpiece Tom Jones, on the one hand, is a panoramic novel that surveys the lives of magistrates, ingénues, thieves, and bastards with a sweep that anticipates the 19th-century novels of George Eliot and Charles Dickens. But Tom Jones is conveyed by an oddly intrusive narrator who frequently halts the story to praise his powers of observation and wonder about the nature of fiction. Likewise, Richardson’s epistolary novels, which are often praised for their psychological depth, also engage in self-reflexive gestures worthy of Sterne. Richardson loves to remind his readers that, like them, his characters are also reading one another’s letters. But if Richardson’s and Fielding’s novels possess an experimental edge, it’s also the case that Sterne’s wild, metafictional work often behaves like a more “conventional” novel. Whereas Rabelais or Swift had only the most minimal use for story or character, Tristram Shandy is deeply invested in its plot (however slow and endlessly digressive) and its people (however ridiculous and insane). It’s the combination of these two literary strains—the reflexive, digressive essay and the coherent, character-driven narrative—that makes Sterne unique. With one hand he tugs at the reader’s heartstrings; with the other he pulls back the authorial curtain. Few novelists have accomplished this balancing act—although some of the most accomplished contemporary writers, including David Foster Wallace, Tom McCarthy, and Zadie Smith, have attempted it. The work that comes closest to Tristram Shandy in this respect is Cervantes’ Don Quixote, which spends most of its length mocking those who take stories too seriously before bidding farewell to its titular character in one of the most affecting death scenes in literature. Sterne’s connection to a host of playful, experimental forebears, and to some we think of as traditionalists, doesn’t make his own work less odd. If anything, it demonstrates that 18th-century literature is more formally complex, more self-reflexive, more “modern”—more like Tristram Shandy—than we might imagine.